CF: Bob, I have been researching and writing about Arthur Vandenberg, Jr., son of Senator Arthur Vandenberg (R-Michigan). Vandenberg, Jr. was gay. He was named Appointments Secretary by President Eisenhower in 1952 and fired in 1953—just before the inaugural. (FBI Director) Hoover outed him to the President. CF: Did you know Vandenberg Jr. ? RKG: No, I did not. I did know his father. CF: What do you think of Eisenhower’s letter firing him? RKG: This letter make me nervous, itch and sweat on his behalf. When I read that, the awful pain to hide something like this! The sweeping totality (of the ban, Executive Order 10450) to not hire a single homosexual…it was a witch-hunt invitation to the entire country. CF: You were appointed to the exact same job as Arthur Vandenberg, Jr. three years after his firing at the hands of Hoover. How did you miss his fate, fired for “health reasons”? RKG: It took six weeks to get a clearance. I remember how relieved I was when the Naval Department said, “you got your security clearance. I tried to act as nonchalant as I could, even though my heart was pounding. I was still trying to make myself straight, dating women. If I had been in any way sexually active, I would have been outed. I was an open book, working twenty -hour days. That was fulfilling enough for me. 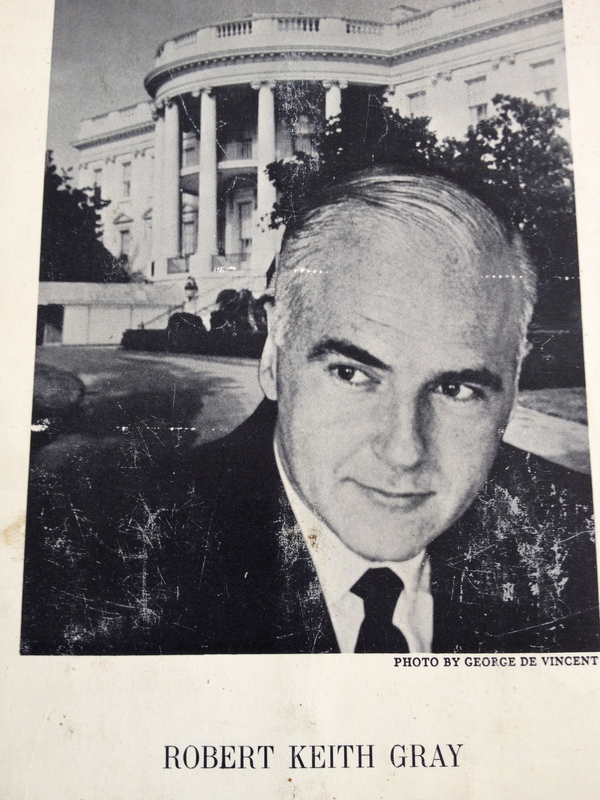 CF: What was it like to be gay in 1956 at the White House? RKG: You cannot conceive what it was like. Eisenhower was a fair guy, but the law was the law. CF: But what about J. Edgar Hoover? CF: Help me understand Nebraska back in the day. RKG: It is so very hard to appreciate how far we have come. The younger generation doesn’t realize this at all. In my hometown (Hastings, Nebraska, an old railroad town, population around 10,000 in the 1920s), there were two known queers. The two “town queers” is what people said. CF: Your memory combines one of the mythic American moments with imagined outcast men. So how do you feel now about President Eisenhower firing his family friend and political counsel Vandenberg? RKG: Those letters show how kind and understanding a man Eisenhower was. He treated it (homosexuality) as a sickness which is what intelligent people did in his time. 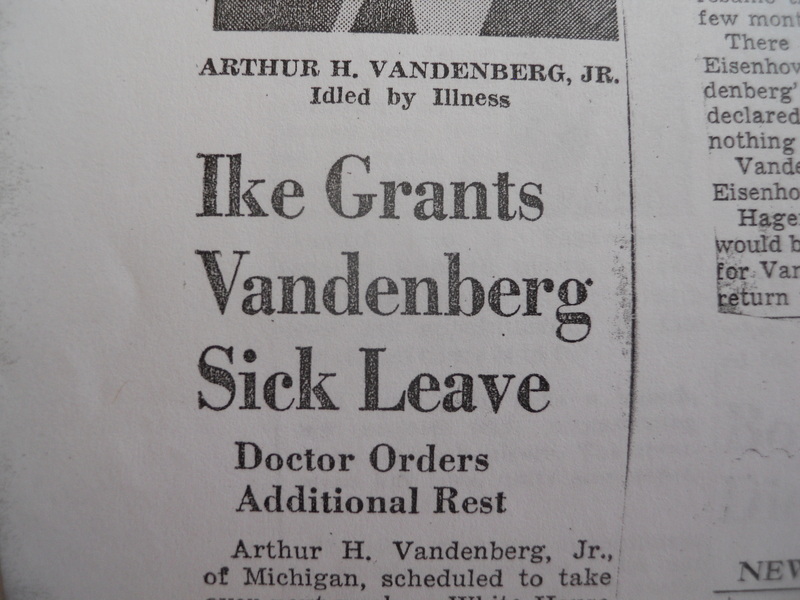 The letter to Vandenberg is very impressive and a nice thing he did –for his age, at that time—providing a cover– ‘health’. Most people would have said ‘these queers’. (Studying the letter): It is a very warm letter. He underscored the cover. Ike was a very decent guy. Obviously, he felt for him. CF: At age ninety, what do you say to young people about the distance gays and lesbians have traveled? RKG: It is so tough to take yourself as far back as that, to the “Golden Spike” days. Back then there were no outlets at all. There was no way to know if there was anyone else in the world. CF: So, how did you find your way into the highest levels of Washington, working for President Eisenhower? RKG: I should write a book, “how to look for a job”! That first month, I walked the pavement. I had been a poli-sci major, and had enough money to last thirty days. I was up all night writing letters! When I would talk to two people, those two would recommend me to four. Eventually, I got to the Deputy Assistant Secretary of Navy for Manpower and got my first job. I also wrote a letter to Fred Seaton, publisher of my hometown newspaper, “The Hastings Tribune”. Seaton owned several Midwest newspapers, had been a Senator. (note: Seaton had been appointed to the seat vacated by the death of Nebraska’s notoriously anti-gay Senator Kenneth Wherry, a leader of anti-homosexual witch-hunts along with Senator Joseph McCarthy). “Seaton called me one morning. He had become Sherman Adam’s Deputy Chief of Staff. He asked, would I come for breakfast. “Seaton told me that they were looking for someone to head-up “the patronage jobs”, at the White House. They were looking for a thirty-day part-time replacement. Three months later, I had become chief of staff to Sherman Adams. Adams was a tyrant. The rumor was “Sherman Adams eats babies for breakfast”. I was scared to death of him, and loved him. CF: Here is Adams again choosing someone with no family, able to put in twenty-hour days? CF: So how did the gay issue play-out in later years, after you had left Eisenhower? CF: And by the Kennedy administration, you never heard from J. Edgar Hoover? RKG: My first secretary at Hill & Knowlton was Marie Tolson, Clyde Tolson’s niece! (Note: Hoover’s companion, Clyde Tolson was Associate Director of the FBI from 1930-1972). Some years later, I remember getting a call from President Nixon’s personal assistant Rosemary Woods. She said that her brother Joe—worked for the FBI, had ten kids—“if you ever run across anything good for Joe….”. I didn’t do anything, but Hoover must have found out—you did not leave Hoover. There must have been a buzz about Joe looking for a new opportunity. Hoover called Rosemary’s brother, Joe Woods, and fired him. “You’re out of here”, Hoover said, according to Bob Gray.